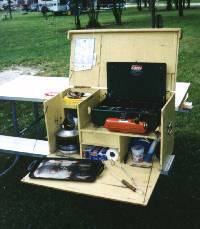 To make camp chow it's necessary to have a well equipped camp kitchen. That doesn't mean a food processor and a blender; the trees don't have outlets on them. - Coleman® Liquid fuel 2 burner stove. - Colgan's® sparker for lighting stove. - Extra flints (butane lighter type). - Cast iron skillet w/ lid - 10" diameter. - Cast iron Dutch Oven - 14" diameter. - Heavy stainless steel 1 and 1.5 qt Sauce pans. - Tea kettle (whistle optional). - 4 and 6 qt aluminum pots. - Wooden utensels: spatula, spoons, etc. - Can opener: a good one, w/ cutting wheel. - Inexpensive plastic table cloth. - Melmac® or equiv. plates. - Melmac® or equiv. bowls. - Terry cloth washrags (use for napkins (serviettes)). - Plastic dish pan (hospital basin). - Dish drainer (mesh shopping bag). - Windshield scrubber (mesh covered sponge). The smaller items are kept in Cheese Boxes (Velveta® type). Every thing except the Dutch Oven fits into the wooden kitchen box. A few of the items may sound a litle strange but there is a definite reason for eash one. The empty onion bag makes a GREAT pot scrubber; it makes quick work of clean-up and it doesn't scratch the pots. The table-cloth and napkins - we are civilized, aren't we? The hurricane lamps are for those romantic candle-light dinners; the wind won't blow out the candles. A lot of beginners think that if they use paper plates and plastic utensils that they are saving on cleanup - plastic knives and forks break - paper plates just won't do; they absorb juices and become soggy. Disposal is not very freindly to the environment. Besides you have to wash the cookware anyway; the dishes take only a few more minutes.